Sustainable Brands is bringing more global business and brand leaders together than ever before. This year, you have the opportunity to join a remote audience of sustainability analysts, brand strategists, and design innovators for an exclusive live streamed event from London, UK, November 4-5. Hundreds conference attendees from 23 countries will share how better brands will shape the future by keeping tabs on the changing playing field. 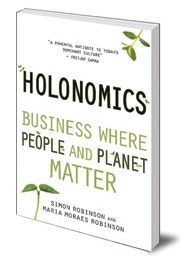 Simon and Maria’s book, Holonomics: Business Where People and Planet Matter, describes a new way of thinking that teaches business leaders how to adapt in innovative ways. To fully know the world, nature, people and phenomena, the book argues, we need to use four ways of knowing – thinking, feeling, sensing and intuition. We also have to ensure that the five universal human values of peace, love, truth, right-action and non-violence are genuinely present in each part of our organizations, ecosystems, and most of all, ourselves. By expanding our view accordingly, Simon and Maria will claim, we can come to realize that brands are not a thing to be known or controlled. They are a magnificent, mysterious odyssey to be experienced. We therefore need to shift from measuring economic brand value to holonomic brand value. This talk will explain how to apply holonomic thinking to both business and brand strategy, while exploring the nature and essence of truly authentic brands. The link above also provides you with the full line-up of inspirational speakers who will be sharing their knowledge and insights during these opening plenary sessions. And if you cannot watch live, the sessions will also be available later to watch on-demand. ← Social Entrepreneurism, The Launch of Ashoka Changemakers in Brazil and the film Who Cares? Excelent! Maravilhoso! I’ll watch from Sao Paulo, SP, Brazil. And now…. let’s share. Tks for post.